Douglas MacArthur, the son of the high-ranking military figure, Arthur MacArthur, was born in Little Rock, Arkansas, on 26th January, 1880. Although previously a poor scholar, in 1903 MacArthur graduated first in his 93-man class, at West Point Military Academy. Commissioned in the Corps of the Engineers, MacArthur was sent by the United States Army to the Philippines and by 1904 had been promoted to the rank of first lieutenant. Later that year he joined his father who was serving in Far East before becoming aide-de-camp to President Theodore Roosevelt in 1906. MacArthur was assigned to general staff duty with the War Department and was an official observer with the Vera Cruz Expedition. 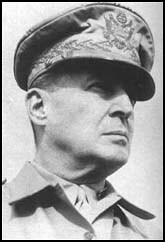 On the advice of General Leonard Wood, MacArthur was promoted to major. In the First World War MacArthur commanded the 42nd Division on the Western Front and was decorated 13 times and cited seven additional times for bravery. Promoted the the rank of brigadier in August, 1918, three months later he became the youngest divisional commander in France. After the war MacArthur returned to the United States where he became brigadier general and the youngest ever superintendent of West Point in its 117 year history. Over the next three years he doubled its size and modernized the curriculum. In 1922 MacArthur was sent to the Philippines where he commanded the newly established Military District of Manila. At the age of forty-three MacArthur became the army's youngest general and in 1928 was appointed president of the American Olympic Committee. MacArthur was appointed chief of staff of the US Army in 1930. Once again he was the youngest man to hold the office and over the next few years attempted to modernize America's army of 135,000 men. MacArthur developed right-wing political views and at one meeting argued that: "Pacifism and its bedfellow, Communism, are all about us. Day by day this cancer eats deeper into the body politic." In June 1932, MacArthur, controversially used tanks, four troops of cavalry with drawn sabers, and infantry with fixed bayonets, on the Bonus Army in Washington. He justified his attack on former members of the United States Army by claiming that the country was on the verge of a communist revolution. Dwight D. Eisenhower and George Patton also took part in this operation. The radical journalist, Drew Pearson, was highly critical of MacArthur's actions. MacArthur's ex-wife, Louise Cromwell, provided Pearson with confidential information about her former husband. This included the story that MacArthur's promotion to major general had come through the political intervention of her father, Edward T. Stotesbury. After publishing the story Pearson found himself being sued by MacArthur for $1,750,000. Pearson looked to be in trouble when Louise Cromwell refused to testify in court. After receiving a tip-off from one of his contacts, Pearson met MacArthur's young mistress who had been dispatched back to the Philippines. She handed over a collection of his love letters. Pearson then used these letters to persuade MacArthur to withdraw his libel action. In 1935 President Franklin D. Roosevelt sent MacArthur to organize the defence of the Philippines. He retired from the army in 1937 but stayed on the island where he became the country's military adviser. When negotiations with the Japanese government broke down in June 1941, Roosevelt recalled MacArthur to active duty as a major general and was granted $10 million to mobilize the Philippine Army. It was also decided to send MacArthur 100 B-17 Flying Fortress to help defend the Philippines. Most of MacArthur's troops were deployed to protect the two main islands of Luzon and Mindanao and by October 1941, MacArthur informed General George Marshall that he now had 135,000 troops, 227 assorted fighters, bombers and reconnaissance aircraft and this provided a "tremendously strong offensive and defensive force" and claimed that the Philippines was now the "key or base point of the US defence line." General Douglas MacArthur now ordered a general retreat to the Bataan peninsula. A series of Japanese assaults forced the US defensive lines back and on 22nd February, 1942, MacArthur was ordered to leave Bataan and go to Australia. General Jonathan Wainright remained behind with 11,000 soldiers and managed to hold out until the beginning of May. The American forces were re-organized and MacArthur was appointed Supreme Commander of the Southwest Pacific Area and Admiral Chester Nimitz became Commander in Chief of the US Pacific Fleet. Along with Admiral Ernest King Commander-in-Chief of the US Navy, Macarthur and Nimitz, decided that their first objective should be to establish and protect a line of communications across the South Pacific to Australia. This resulted in the battles of Coral Sea and Midway, where the Japanese Navy lost all four of her carriers. In the summer of 1942 fighting in the Pacific was concentrated around Rabaul, the key Japanese military and air base in the Soloman Islands. On 7th August there was an Allied landings at Guadalcanal. Over the next eight months there were ten major land battles and seven major naval engagements in this area. MacArthur now developed what became known as his island hopping tactics. This strategy involved amphibious landings on vulnerable islands, therefore bypassing Japanese troop concentrations on fortified islands. This had the advantage of avoiding frontal assaults and thus reducing the number of American casualties. By the spring of 1944, 100,000 Japanese soldiers were cut off at Rabaul and the Japanese 18th Army were surrounded in New Guinea. In September US troops took Morotai and all of New Guinea was now in Allied hands. It was not until 1944 that MacArthur was given permission to begin the campaign to recapture the Philippines. The first objective was the capture of Leyte, an island situated between Luzon and Mindanao. After a two day naval bombardment General Walter Krueger and the 6th Army landed on 22nd October, 1944. This was followed by Leyte Gulf, the largest naval engagement in history. It was a decisive victory for the Allies with the Japanese Navy lost four carriers, three battleships and ten cruisers. It was now clear that the US Navy now had control of the Pacific and that further Allied landings in the region were likely to be successful. After bitter fighting the US forces captured the important port of Ormoc on 10th December. By the time Leyte was secured the US Army had lost 3,500 men. It is estimated that over 55,000 Japanese soldiers were killed during the campaign. On 9th January 1945 Allied troops landed on Luzon, the largest of the islands in the Philippines. The Japanese Army, under General Tomoyuki Yamashita, fought a vigorous rearguard action but within a month MacArthur and his troops had crossed the Central Plain and were approaching Manila. Yamashita and his main army now withdrew to the mountains but left enough troops in Manila to make the capture of the city as difficult as possible. An estimated 16,000 Japanese soldiers were killed before it was taken on 4th March 1945. General Robert Eichelberger and the US 8th Army landed on Mindanao on 10th March and began advancing through the southern Philippines. This included the capture of Panay, Cebu, Negros and Bohol. MacArthur's last amphibious operation was at Okinawa. Lying just 563km (350 miles) from the Japanese mainland, it offered excellent harbour, airfield and troop-staging facilities. It was a perfect base from which to launch a major assault on Japan, consequently it was well-defended, with 120,000 troops under General Mitsuru Ushijima. The Japanese also committed some 10,000 aircraft to defending the island. After a four day bombardment the 1,300 ship invasion forced moved into position off the west coast of Okinawa on 1st April 1945. The landing force, under the leadership of Lieutenant-General Simon Buckner, initially totalled 155,000. However, by the time the battle finished, more than 300,000 soldiers were involved in the fighting. This made it comparable to the Normandy landing in mainland Europe in June, 1944. On the first day 60,000 troops were put ashore against little opposition at Haguushi. The following day two airfields were captured by the Americans. However when the soldiers reached Shuri they came under heavy fire and suffered heavy casualties. Reinforced by the 3rd Amphibious Corps and the 6th Marine Division the Americans were able to repel a ferocious counter-attack by General Mitsuru Ushijima on 4th May. At sea off Okinawa a 700 plane kamikaze raid on 6th April sunk and damaged 13 US destroyers. The giant battleship, Yamato, lacking sufficient fuel for a return journey, was also sent out on a suicide mission and was sunk on 7th May. On 11th May, Lieutenant-General Simon Buckner, ordered another offensive on the Shuri defences, and the Japanese were finally forced to withdraw. Buckner was killed on 18th June and three days later his replacement, General Roy Geiger, announced that the island had finally been taken. When it was clear that he had been defeated, Mitsuru Ushijima committed ritual suicide (hari-kiri). The capture of Okinawa cost the Americans 49,000 in casualties of whom 12,520 died. More than 110,000 Japanese were killed on the island. While the island was being prepared for the invasion of Japan, a B-29 Superfortress bomber dropped an atom bomb on Hiroshima on 6th August 1945. Japan did not surrender immediately and a second bomb was dropped on Nagasaki three days later. On 10th August the Japanese surrendered and the Second World War was over. MacArthur was named Supreme Commander for the Allied Powers (SCAP) and he received the formal surrender and President Harry S. Truman appointed him as head of the Allied occupation of Japan. He was given responsibility of organizing the war crimes tribunal in Japan and was criticized for his treatment of Tomoyuki Yamashita, who was executed 23rd February, 1946. However he was praised for successfully encouraging the creation of democratic institutions, religious freedom, civil liberties, land reform, emancipation of women and the formation of trade unions. On the outbreak of the Korean War in 1950, MacArthur was appointed commander of the United Nations forces. The surprise character of the attack enabled the North Koreans to occupy all the South, except for the area around the port of Pusan. On 15th September, 1950, MacArthur landed American and South Korean marines at Inchon, 200 miles behind the North Korean lines. The following day he launched a counterattack on the North Koreans. When they retreated, MacArthur's forces carried the war northwards, reaching the Yalu River, the frontier between Korea and China on 24th October, 1950. Harry S. Truman and Dean Acheson, the Secretary of State, told MacArthur to limit the war to Korea. MacArthur disagreed, favoring an attack on Chinese forces. Unwilling to accept the views of Truman and Acheson, MacArthur began to make inflammatory statements indicating his disagreements with the United States government. MacArthur gained support from right-wing members of the Senate such as Joe McCarthy who led the attack on Truman's administration: "With half a million Communists in Korea killing American men, Acheson says, 'Now let's be calm, let's do nothing'. It is like advising a man whose family is being killed not to take hasty action for fear he might alienate the affection of the murders." In April 1951, Harry S. Truman removed MacArthur from his command of the United Nations forces in Korea. McCarthy now called for Truman to be impeached and suggested that the president was drunk when he made the decision to fire MacArthur: "Truman is surrounded by the Jessups, the Achesons, the old Hiss crowd. Most of the tragic things are done at 1.30 and 2 o'clock in the morning when they've had time to get the President cheerful." On his arrival back in the United States MacArthur led a campaign against Harry S. Truman and his Democratic Party administration. Soon after Dwight Eisenhower was elected president in 1952 he consulted with MacArthur about the Korean War. MacArthur's advice was the "atomic bombing of enemy military concentrations and installations in North Korea" and an attack on China. He rejected the advice and MacArthur played no role in Eisenhower's new Republican administration. After leaving the United States Army, MacArthur accepted a job as chairman of the board of the Remington Rand Corporation. Douglas MacArthur died in the Water Reed Hospital, Washington, on 5th April, 1964. (1) General Dwight D. Eisenhower, made several references to Douglas MacArthur in his diary during the Second World War. 29th January, 1942: MacArthur has started a Hood of communications that seem to indicate a refusal on his part to look facts in the face, an old trait of his. He has talked about big naval concentrations; he has forwarded (probably inspired) letter from Mr. Quezon; statements (Quisling) from Aguinaldo; he complains about lack of unity of command, about lack of information. He's jittery! 3rd February, 1942: Looks like MacArthur is losing his nerve. I'm hoping that his yelps are just his way of spurring us on, but he is always an uncertain factor. The Dutch want planes; the Australians want planes; ABDA has to have planes; China must get them; the British need them in Near East. What a mess! 8th February, 1942: Another long message on "strategy" to MacArthur. He sent in one extolling the virtues of the flank offensive. Wonder what he thinks we've been studying for all these years. His lecture would have been good for plebes. Today another long wail from Quezon. I'll have to wait though, because it is badly garbled. I think he wants to give up. 23rd February, 1942: Message to MacArthur was approved by president and dispatched. I'm dubious about the thing. I cannot help believing that we are disturbed by editorials and reacting to "public opinion" rather than to military logic. Watson is certain we must get MacArthur out, as being worth "five army corps. " He is doing a good job where he is, but I'm doubtful that he'd do so well in more complicated situations. Bataan is made to order for him. It's in the public eye; it has made him a public hero; it has all the essentials of drama; and he is the acknowledged king on the spot. If brought out, public opinion will force him into a position where his love of the limelight may ruin him. 19th March, 1942: MacArthur is out of Philippine Islands. Now supreme commander of "Southwest Pacific Area." The newspapers acclaim the move - the public has built itself a hero out of its own imagination. I hope he can do the miracles expected and predicted; we could use a few now. Strange that no one sees the dangers. Some apply to MacArthur, who could be ruined by it. But this I minimize; I know him too well. The other danger is that we will move too heavily in the Southwest. Urging us in that direction now will be: Australians, New Zealanders, our public (wanting support for the hero), and MacArthur. If we tie up our shipping for the SW Pacific, we'll lose this war. (2) General George Marshall to General Douglas MacArthur after the Teheran Conference in November 1943. Navy propaganda to that end; he had the complete support of the Secretary of the Navy, Knox, the support in general principle of President Roosevelt and his Chief of Staff, Admiral Leahy, and in many cases of General Arnold, the head of the Air Force. (3) In his autobiography, Reminiscences, Douglas MacArthur describes a meeting he had with President Franklin D. Roosevelt. I once again pointed outlaw necessary for the winning of the war was the recapture of Luzon, and how simple it would be, once Manila Bay and the northern part of Luzon were back in our hands, to deny Japan the oil, rubber, and rice she was presently draining out of the conquered areas along the shores of the South China Sea and farther south. The President interrupted: "But Douglas, to take Luzon would demand heavier losses than we can stand." "Mr. President," I replied, "my losses would not be heavy, anymore than they have been in the past. The days of the frontal attack should be over. Modern infantry weapons are too deadly, and frontal assault is only for mediocre commanders. Good commanders do not turn in heavy losses." I sketched my own over-all plan for future operations in the South-west Pacific. Once I held the Philippines, I would begin the reconquest of the Dutch East Indies, using the Australian First Army for the ground operations. Operating from the Philippines, I could sweep down on these Japanese-held islands from the rear. I spoke of my esteem for Admiral King and his wise estimate of the importance of the Pacific as a major element in the global picture, however I might disagree with some of his strategic concepts. Admiral Leahy seemed to support what I said, and the President accepted my recommendations and approved the Philippine plan. (4) General Douglas MacArthur wrote about the invasion of the Philippines in December 1941 in his autobiography, Reminiscences (1964). At 3.40 on Sunday morning, December 8, 1941, Manila time, a long-distance telephone call from Washington told me of the Japanese attack on Pearl Harbor, but no details were given. It was our strongest military position in the Pacific. Its garrison was a mighty one, with America's best aircraft on strongly defended fields, adequate warning systems, anti-aircraft batteries, backed up by our Pacific Fleet. My first impression was that the Japanese might well have suffered a serious setback. We had only one radar station operative and had to rely for air warning largely on eye and ear. At 9:30 a.m. our reconnaissance planes reported a force of enemy bombers over Lingayen Gulf heading toward Manila. Major General Lewis H. Brereton, who had complete tactical control of the Far East Air Force, immediately ordered pursuit planes up to intercept them. But the enemy bombers veered off without contact. When this report reached me, I was still under the impression that the Japanese had suffered a setback at Pearl Harbor, and their failure to close in on me supported that belief. I therefore contemplated an air reconnaissance to the north, using bombers with fighter protection, to ascertain a true estimate of the situation and to exploit any possible weaknesses that might develop on the enemy's front. But subsequent events quickly and decisively changed my mind. I learned, to my astonishment, that the Japanese had succeeded in their Hawaiian attack, and at 11:45 a report came in of an over- powering enemy formation closing in on Clark Field. Our fighters went up to meet them, but our bombers were slow in taking off and our losses were heavy. Our force was simply too small to smash the odds against them. MacArthur was convinced that an occupation of the Philippines was essential before any major attack in force should be made on Japanese-held territory north of Luzon. The retaking of the Philippines seemed to be a matter of great interest to him. He said that he had sufficient ground and air forces for the operation and that his only additional needs were landing-craft and naval support. Nimitz developed the Navy's plan of by-passing the Philippines and attacking Formosa. He did not see that Luzon, including Manila Bay, had advantages that were not possessed by other areas in the Philippines that could be taken for a base at less cost in lives and material. As the discussions progressed, however, the Navy Commander in the Pacific admitted that developments might indicate a necessity for occupation of the Manila area. Nimitz said that he had sufficient forces to carry out either operation. It was highly pleasing and unusual to find two commanders who were not demanding reinforcements. Roosevelt was at his best as he tactfully steered the discussion from one point to another and narrowed down the area of disagreement between MacArthur and Nimitz. The discussion remained on a friendly basis the entire time, and in the end only a relatively minor difference remained - that of an operation to retake the Philippine capital, Manila. This was solved later, when the idea of beginning our Philippine invasion at Leyte was suggested, studied and adopted. General MacArthur's invasion forces have established three firm beachheads on the east coast of the island of Leyte, in the Central Philippines, and last night were reported to be pushing inland against stiffening Japanese resistance. According to a broadcast from the Leyte area, picked up in San Francisco. Tacloban airfield, on the north-eastern tip of Leyte Island, has been captured. Earlier President Roosevelt announced in Washington that the operations are going according to plan, with extremely light losses. The Japanese were taken by surprise because, as General MacArthur explained in his announcement of the landing, they were expecting attacks on the large island of Mindanao, south of Leyte. "The strategic results of the capturing of the Philippines will be decisive." MacArthur said. " To the south 500,000 men will be cut off without hope of support and the culmination will be their destruction at the leisure of the Allies." Thus General MacArthur has fulfilled the promise to return that the made two and a half years ago when his forces left the Philippines. An American broadcaster said that the Commander-in-Chief waded ashore with one of the landing parties and quoted him as saying, "I will stay for the duration now." The President of the Philippine Commonwealth, Sergio Osmena, with members of his Cabinet, went with the American forces and already has established the seat of government on Philippine soil. (7) In his memoirs General Douglas MacArthur wrote about his first meeting with Emperor Hirohito after the end of the Second World War. (8) List of reforms that General Douglas MacArthur submitted to Emperor Hirohito and his Japanese government in October 1945. (9) General Douglas MacArthur wrote a report for Harry S. Truman where he advocated that Tomoyuki Yamashita should be tried as a war criminal (March, 1946). It is not easy for me to pass penal judgment upon a defeated adversary in a major military campaign. I have reviewed the proceedings in vain search for some mitigating circumstances on his behalf. I can find none. Rarely has so cruel and wanton a record been spread to public gaze. Revolting as this may be in itself, it pales before the sinister and far reaching implication thereby attached to the profession of arms. The soldier, be he friend or foe, is charged with the protection of the weak and unarmed. It is the very essence and reason for his being. When he violates this sacred trust, he not only profanes his entire cult but threatens the very fabric of international society. The traditions of fighting men are long and honorable. They are based upon the noblest of human traits-sacrifice. This officer, of proven field merit, entrusted with high command involving authority adequate to responsibility, has failed this irrevocable standard; has failed his duty to his troops, to his country, to his enemy, to mankind; has failed utterly his soldier faith. The transgressions resulting therefrom as revealed by the trial are a blot upon the military profession, a stain upon civilization and constitute a memory of shame and dishonor that can never be forgotten. Peculiarly callous and purposeless was the sack of the ancient city of Manila, with its Christian population and its countless historic shrines and monuments of culture and civilization, which with campaign conditions reversed had previously been spared. It is appropriate here to recall that the accused was fully forewarned as to the personal consequences of such atrocities. On October 24-four days following the landing of our forces on Leyte - it was publicly proclaimed that I would "hold the Japanese Military authorities in the Philippines immediately liable for any harm which may result from failure to accord prisoners of war, civilian internees or civilian non combatants the proper treatment and the protection to which they of right are entitled." On December 23rd, General Walker was killed in a freak jeep accident. It was a great personal loss to me. It had been "Johnny" Walker who had held the line, with courage and brilliant generalship, at the very bottom of Korea, until we could save him by slicing behind the enemy's lines at Inchon. It had been Walker who, even in the darkest hours, had always radiated cheerful confidence and rugged determination. It was a difficult time to change field commanders, but I acquired one of the best in General Matthew Ridgway. An experienced leader with aggressive and fighting qualities, he took command of the Eighth Army at its position near the 38th parallel. After inspecting his new command, he felt he could repulse any enemy attempt to dislodge it. On New Year's Day, however, the Reds launched a general offensive in tremendous force, making penetrations of up to 12 miles. It forced the Eighth Army into further withdrawal. By January 4th, the enemy had recaptured Seoul, and by January 7th, the Eighth Army had retired to new positions roughly 70 miles south of the 38th parallel. The dispute that rages between General Douglas MacArthur and the Truman administration over how to win the Korean war has reached fever heat again. The administration may shortly ask the general to clear with broad foreign policy issues. This may or may not prove acceptable to MacArthur, but State Department officials as well as some others with great influence at the White House privately say something must be done to prevent a repetition of last week's exchange of shocks and harsh words between Tokyo and Washington. the State Department. Informants said today that order was called to MacArthur's attention at that time. Friday night, Washington time, MacArthur left Tokyo for the Thirty-eighth Parallel area of Korea to order United Nations forces to cross into North Korea as tactical requirements made necessary. Before leaving Tokyo he issued a statement to the press. In this statement he made a bid for peace talks with his opposite number on the Communist side, said the Chinese Reds were licked and incapable of waging modem war and warned that if the United Nations launched attacks on Chinese bases and coastal area the Red nation would probably suffer military collapse. and Mr. Truman, a rather meaningless statement was issued, designed to say on Saturday that Washington had nothing to do with what MacArthur had declared Friday night. The statements said MacArthur had authority to conduct military operations but that political issues which "he has stated are beyond his responsibilities are being dealt with in the U.N. and by the governments having troops in Korea." military collapse of Red China by a limited coastal attack and base-bombing war. A Tokyo dispatch yesterday suggested MacArthur probably was trying to divert the Chinese Reds' attention from Korea to the danger of a coastal attack. Whatever his objective, any statement he makes - even mingled in with "ifs" - about extending the war in the Far East always sends huge shudders among the Canadian, French, British and other friendly governments. When the Europeans come in to the State Department wanting to know "what does MacArthur propose to do," Acheson and his aides get upset about the problems of holding together the political side of the coalition of which MacArthur is military commander. No words of any broadcaster will add to, or detract from, General MacArthur's military stature. When the President relieved him of his commands at one o'clock this morning, a sort of emotional chain reaction began. It might be useful to examine some of the issues raised by this decision, for they are rather more important than the fate of a general, or a president, or a group of politicians. Did the President have the constitutional power to fire General MacArthur? He did, without question; even the severest critics of his action admit this. One of the basic principles of our society is that the military shall be subject to civilian control. At the present time when, as a result of our rearmament programme, the military is exercising increasing influence and power in both domestic and international affairs, it is of some importance that that principle be maintained. It is a principle to which the over-whelming majority of professional soldiers subscribe. There developed, over a period of months, a basic disagreement between General MacArthur on the one hand and the President, the Joint Chiefs of Staff, the State Department and our European allies on the other as to how the war in Korea should be conducted; and, more importantly, a disagreement as to how, and where, the forces of the free world should be deployed to meet the threat of world Communism. General MacArthur was sent certain instructions, and he ignored or failed to obey them. Those orders, wise or foolish, came from his superiors. We as private citizens are entitled to agree or disagree with the policy and the orders, but so far as military men are concerned, the Constitution is quite specific. It doesn't say that a President must be a Republican or a Democrat, or even that he must be wise. It says that he is the commander-in-chief. There occurred an open and public clash between civilian and military authority. It was dramatic, and it was prolonged over a period of almost four months. What hung in the balance was not MacArthur's reputation as a soldier, or Truman's as a statesman, but rather the principle of civilian control of the military men and forces of this country. The issue has now been resolved. It is, as many have remarked, a personal tragedy for General MacArthur at the climax of a brilliant military career. But these matters must be viewed in perspective. Tragedy has also overtaken about fifty-eight thousand young Americans in Korea, and for about ten thousand of them it was permanent - before their careers began. That war is still going on. Is there any reason to believe that General MacArthur's removal will increase the prospects of ending it? Some diplomats are inclined to hope it will. They point to the fact that the Communists have labelled MacArthur the number one aggressor and warmonger. But there is nothing in Communist doctrine to indicate that their policies are determined by the personalities of opposing generals, nothing to hint their objectives do not remain what they were. (13) In an article in Newsday on 28th July, 1993, Murray Kempton suggests that General Matthew Ridgway helped to control the actions of Douglas MacArthur in Korea. In his autobiography, Ridgway recalls a 1950 meeting where the Joint Chiefs of Staff wondered what they could do to restrain General Douglas MacArthur from his head-over-heels plunge toward the Chinese border and disaster in Korea. The chiefs could already look at the map and recognize that MacArthur had arrayed his troops as for a parade, divided their columns and left between them the mountain where enemies could assemble in peace and await the securest chance for war. The chiefs had passed the hours helplessly struggling between their awe of a commander who had been riding with the Cavalry when they were in rompers and their awareness of his terminal folly. Ridgway was then only deputy Chief of Staff and forbidden to speak up in the company of his superiors. Crisis compelled him to break the laws of silence at last. "We owe it to ourselves," he said, to call MacArthur to halt; and it must be done now because even tomorrow could be too late. The chiefs sustained the shock of this breach of Old Army custom and continued to sit inert until what they knew might happen did and all too soon. After the meeting, Air Force Chief of Staff Hoyt Vandenberg congratulated him for his courage. His answer was not thanks for the compliment but renewed urgings that MacArthur be curbed. "Oh, what's the use," Vandenberg replied. "He won't listen." And, thereafter of course, it would be for Ridgway to restore the ruin of the Korean campaign. From the time MacArthur first came into prominence as the youngest American general of World War I, and then the youngest commandant of West Point, and then the youngest Army Chief of Staff, he displayed certain peculiarities that tended to raise the hair on the back of Drew Pearson''s neck: an unfailing theatricality; a tendency to portray his life as a series of triumphal processions; and a rhetoric with a martial ring that, for instance, identified pacificism with Communism. Here was a hero in unheroic times, unhappily hemmed in by the humdrum of peace and the flummery of civilian politics, a general looking for a star of destiny; worse, a general who had the Roman profile, the messianic urge, the oratorical artillery, the mastery of imagery, the brains and the guile to create a great deal of mischief should a fortuitous conjunction of events arise. years and I know what their gratitude means. But never have I seen, even in those days, such expressions of gratitude as from the crowds today." it would have wiped out the two partners, financially and professionally.